IIITM Kerala MSc and M Phil Admission 2019 - IIITM Kerala Postgraduate Courses Admission Notification 2019 has been announced. Indian Institute of Information Technology and Management-Kerala (IIITM-K) has invited applications for admission to the following PG Courses of academic year 2019. Indian Institute of Information Technology and Management-Kerala (IIITM-K) is the academic arm of Dept. of Information Technology, Govt. of Kerala. It was established as an autonomous postgraduate Institute in 2000 and offers Masters, M Phil and PhD Programs in different areas related to Information Technology. All master’s programmes (MSc and MPhil) are affiliated to Cochin University of Science and Technology (CUSAT). Admission to MSc programmes will be based on IIITM-K Common Admission Test (ITCAT) / valid GATE score and admissions to M.Phil programmes will be based on IIITM-K Research Aptitude Test (ITRAT) / valid GATE or NET score. The students who are unable to submit the final mark list in original and provisional degree certificate at the time of admission need to give an undertaking that they will submit the documents by September 30, 2019. The copy of the undertaking is available here . 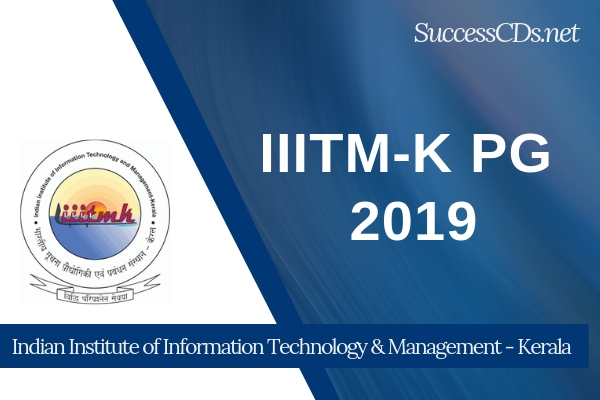 Such candidates need to submit the original mark list and provisional degree certificate as proof of meeting the eligibility criteria by September 30 2019 at the Academic Office of IIITM-K. For eligibility criteria, please check the admission eligibility conditions given for the individual courses. The submitted documents will be further verified by CUSAT. A student can continue the course only if the documents are found in order and the student is found to be meeting the eligibility conditions after the verification of the documents by IIITM-K and CUSAT. Only candidates who have completed the qualifying degree from an institution/ university which is recognized by the University Grants Commission (UGC) need apply. For universities located in India, the university should be a member of the Association of Indian Universities (AIU). The list of members of AIU is available here. The CUSAT guidelines for international students will be followed for students who have completed the qualification from a university located in a foreign country.